Works in timber, stone, steel, mosaic, stoneware; including the design of a carved and mosaic inlayed boardwalk, water pavilion and gardens. 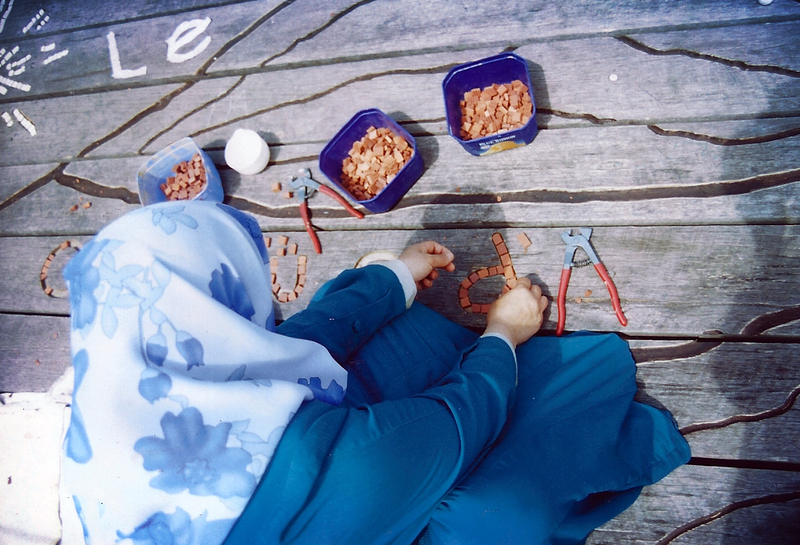 The project involved up to 300 individuals in meaningful art making activities over 18 months between 2003 and 2004. 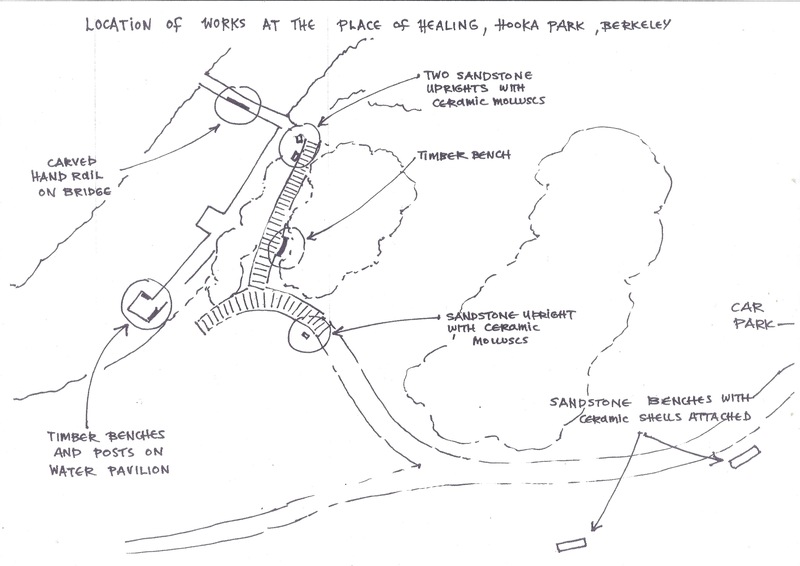 The “Place of Healing” came from a vision by parents with children living with leukaemia, at an event called “Bright Lives” held at Hooka Creek in 2001. This event was initiated to channel feelings of anger into a celebration of life and healing. 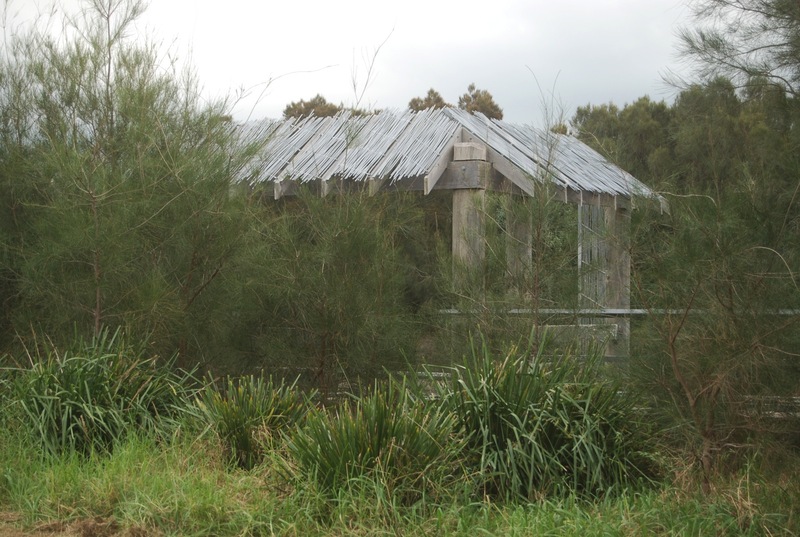 From its inception, the Place of Healing at Hooka Park was designed to be a special place in the Illawarra that celebrates a sense of healing with the environment, of our bodies and our spirits. 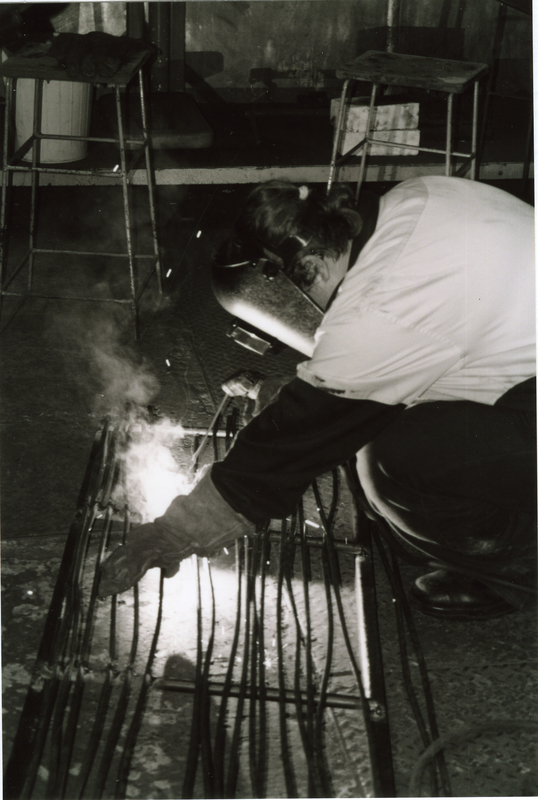 The bridge rail was designed by about 24 young people from Illawarra Sports High School. 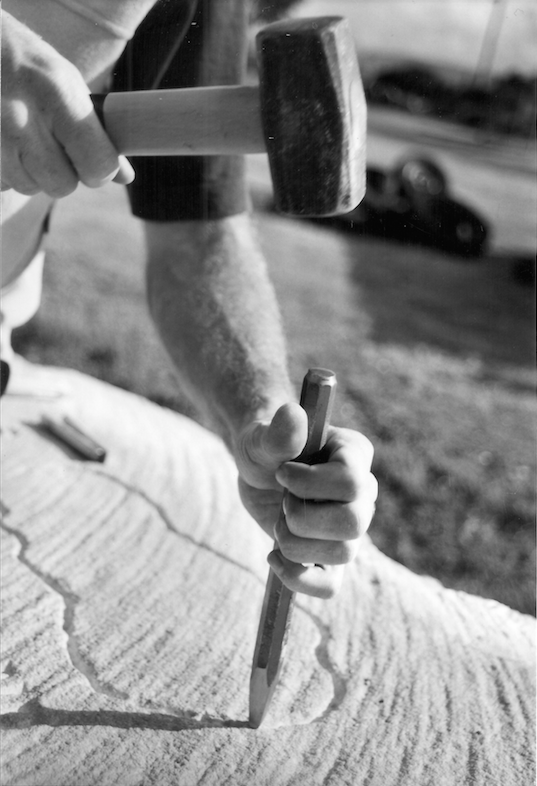 carving the rail took about 8 weeks and involved about 20 individuals. Only three people had previous carving skills. The mosaic works engraved into the bridge rail involved approximately 20 individuals. Only three had previous experience with mosaic. The Jetty acts as a link between the bridge and the water pavilion, connecting the physical world (the food chain on the bridge rail) with the inner self (the contemplative place in the Water Pavilion) Giant plants with mosaic details are carved and inlayed along the jetty planks, depicting traditional Aboriginal healing remedies. 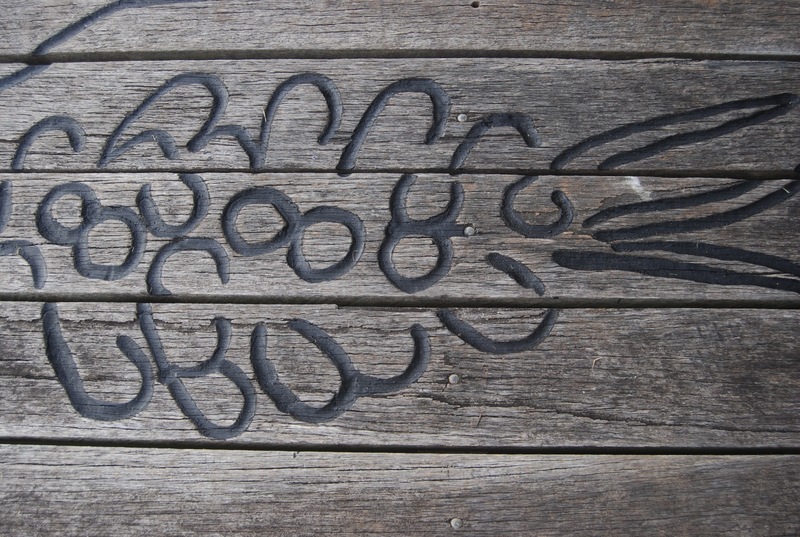 The jetty engravings were designed by Lorraine Brown and Narelle Thomas from Coomaditchie. 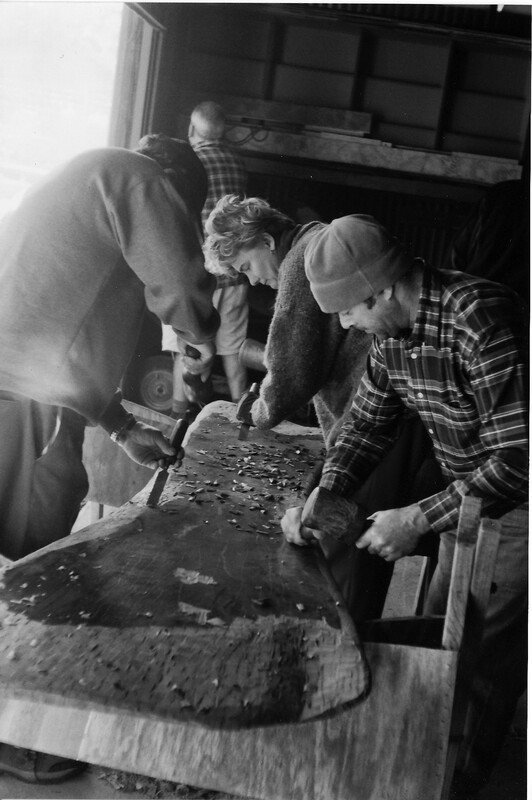 Engraving, staining and inlaying the jetty with mosaic took 8 weeks and involved about 45 individuals. The water pavilion was designed with input from 10 individuals from a cancer support group. 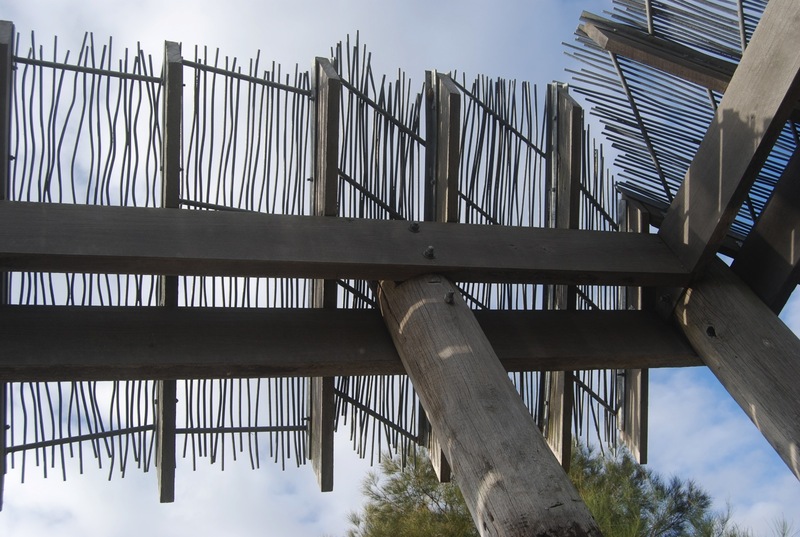 Thatched steel panels were made by apprentices from the Steelhaven Skills Centre and boys at Keelong Juvenile Justice Centre. 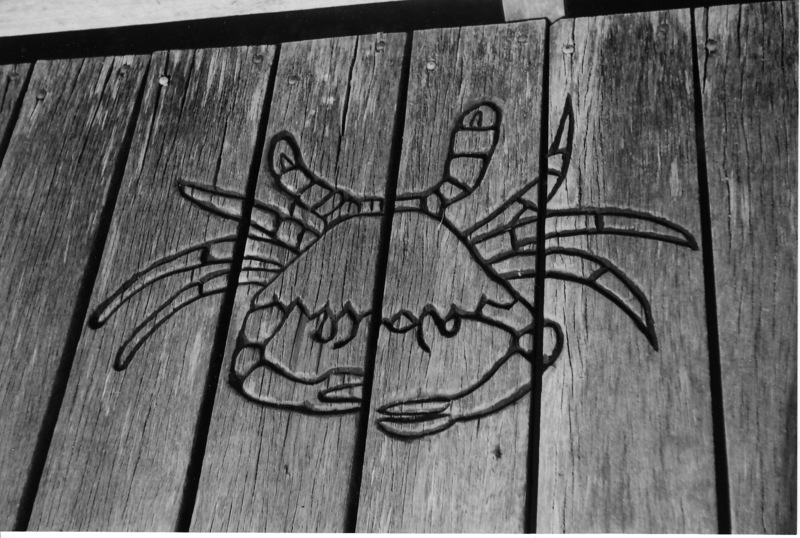 carving on the pavilion decking involved students at Illawarra Sports Highschool, kids from the Youth Crisis Centre as well as local residents. 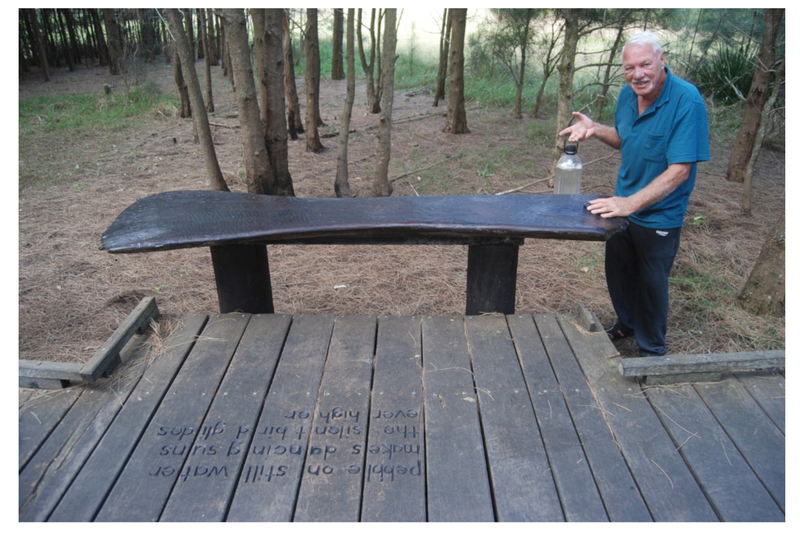 Handprints of kids from camp quality were carved into the the timber benches by local residents. In total 40 individuals were involved in making the water pavilion. 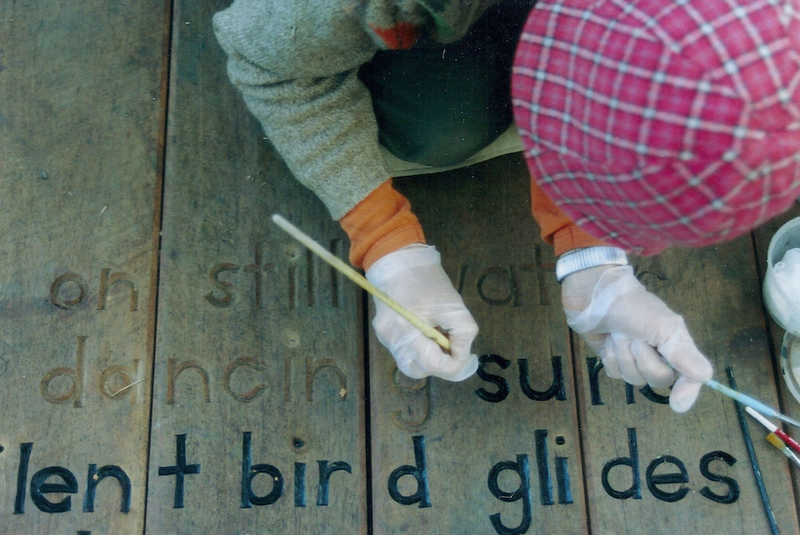 A contemplative haiku written by cancer survivor Barbara was carved into the timber boardwalk facing the bench. Stone seating provides a place to contemplate beautiful vistas across Lake Illawarra. Situated by the main pathway the seats are resting and meeting places for walkers. These works aim to foster awareness and respect of the local Dharrawal culture. 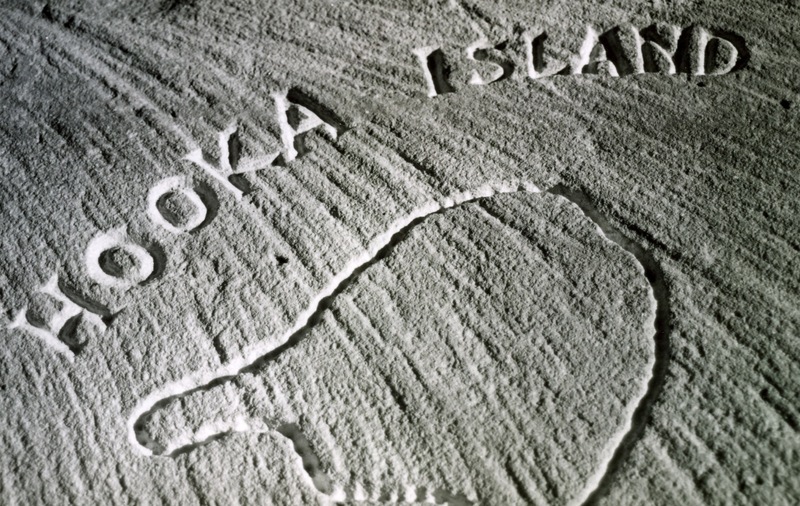 The outlines and names of the islands facing Hooka Park were carved into sandstone benches to inform people about their names and shapes. 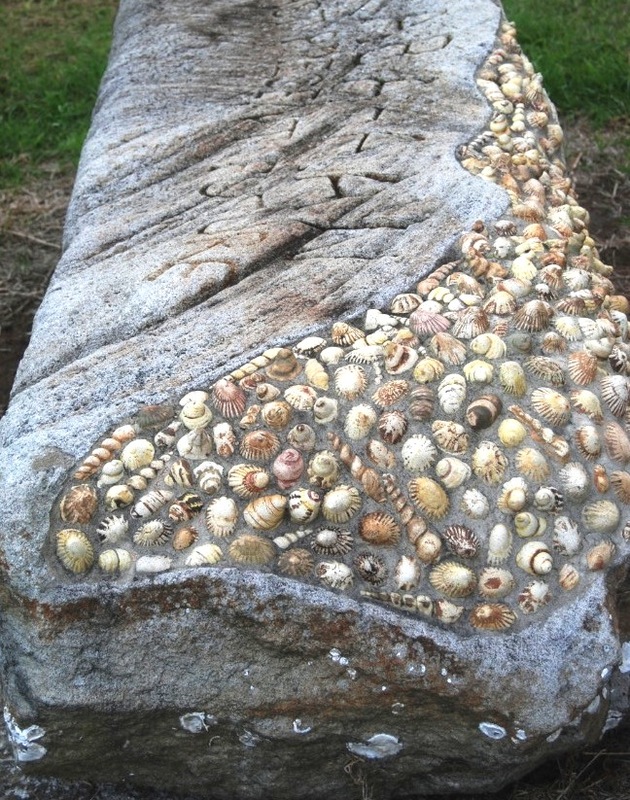 The benches are encrusted with hundreds of stoneware shells, referencing the aboriginal shell middens that were found at Hooka Park. The stone carving involved about 18 individuals, mainly local residents but also aboriginal students at Illawarra Sports High School. The shells were made by 150 individuals. 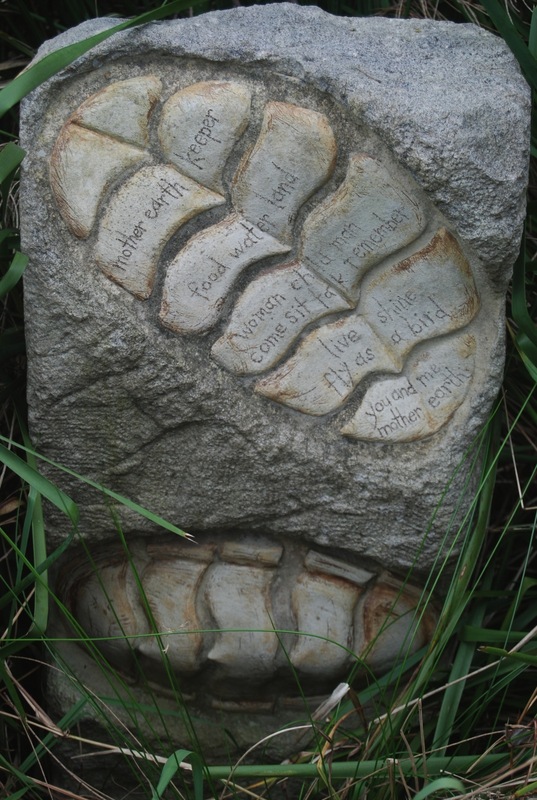 Stoneware “chitons” incised with a poem by a local aboriginal woman, inset into sandstone. Project Manager: Sue Bessell, Wollongong Council. Funding Bodies: Wollongong City Council, Lake Illawarra Authority, Planning NSW, Healthy Cities Illawarra.